Why Would Anyone Want Magnifiers for Beading? Let's face it. Seed beads are small. Very small. Beading needles are very skinny. Their eyes are even skinnier. Do you want to be scrunching up your face to make your eyes focus on something you have to hold 4 inches from your eyes in order to see it properly? Of course not! That's why we have magnifiers for beading. They come in a variety of styles and degrees of magnification. Any lens that magnifies is also going to limit your depth of field, so you need to find the level of magnification that makes stuff big enough to see clearly while still keeping your working field in focus. I have to confess that I am a magnification junkie. I like to see my work big, clear, and bright. Your needs may be less greedy of size, clarity, or brightness, so you may find a perfectly good solution that is cheaper than one I would select. Maybe when you were a kid you tried to start a fire by focusing sunlight through a magnifying glass onto some nice flammable dried grass. That trick still works. And it works whether you meant to do it or just left your big magnifier unattended and uncovered in front of your south-facing window on a sunny day. So be aware of the sun when you leave your magnifier unattended. The safest thing is to cover the glass whenever you leave it. Some magnifiers come with a cover. If not, just use a towel or a pillowcase or whatever. Don't set your sofa to smoldering! If you don't wear glasses, you may find that the glasses that you can buy from a rack at the drugstore work well for you. Those glasses are designed to magnify print so folks who are farsighted can see the letters more easily. But the glasses neither know nor care whether you are farsighted or not. Nor do they care whether you are reading little print or using them as magnifiers for beading. So you can use them. Try them in the store. You can use the little card with fine print that is usually displayed with such glasses to test them out, or you can bring a piece of beadwork made with the smallest beads you usually use, and see how they work. They come in various levels of magnification, so try out a few and see what you like. Find out how far away you need to hold the card of fine print or your beadwork to see it clearly. Ask yourself if that is a comfortable working distance. When I was a Kid, I remember watching my dad doing detailed work with metals in his workshop. Around his head was a metal headband that he wore just a little above the eyebrows. From the sides of that headband came a framework that supported lenses. The framework could be flipped down so the lenses were a couple of inches in front of the eyes, or it could be flipped up to the top of the head, out of the way when it wasn't needed. These things are still around. And they are still useful. They are made mostly of plastic now, so are even lighter than the one my dad used. Many have interchangeable lenses, so you can change the magnification if you want to. The one shown at the right is by Bausch and Lomb and has gotten good review at Amazon. The lenses on this one are plastic so you need to be careful not to scratch them up, but users seem happy with the optical quality and the comfort of this visor magnifier. The quality of the lenses varies in visor magnifiers, and it often varies in line with the price. You can get glass lenses (better), plastic lenses (often not as good as glass) or even plastic Fresnel lenses which may work for you, they are not my favorite magnifiers for beading. Personally, I would only use Fresnel magnifiers if I wanted a light and flat magnifier to read menus, or to use for a few minutes at a time, like to remove a splinter. I used to use a small Fresnel lens when I was trying to identify marks on coins, and it was okay for brief use. These magnifiers hang around your neck on an adjustable strap. I had one that rested on my chest and has a battery operated light that points down and a slot to hold a Fresnel lens. While this are highly portable and highly packable, you can guess that with my impatience with Fresnel Lenses, I was not a happy beader while I used that product. A better choice would be a good quality traditional-type lens, like the one shown at right. It doesn't include a light, but if you are beading by natural light or under the light of a floor lamp of desk lamp, this could be a good solution. If you like to bead under one of the fold-up OttLites, you'll need to pay attention to how far from the lamp you usually work and figure out if there is room to use the magnifier without having it bang into your lamp all the time. Some magnifiers are built into lamps for reading, crafts, or precision work. Or lamps are built into magnifiers. Either way, we are going to consider them here. We'll also include in this category the magnifiers that can be added to lamps you already own. The floor version of the popular OttLite that many beaders love can be fitted with a clamp-on magnifier that extends from 16 to 30 inches from the lamp's stem, so you can move it around to the position and angle that works for you. If you are an OttLite fan, this looks like a nice solution because it has a glass lens in a decent size to work under and enough adjustability to let you work in comfort. Even the fold-down OttLite can sport a magnifier that is attached to the fold-up light part of the device, but with the magnifier so close to the stand I suspect that the stand would be getting in the way a lot when beading. There are a number of products that are a magnifier that can be moved through space either on a gooseneck or an extension arm with tension controls. My first lighted magnifier for beading fell into this general camp. It had a glass lens and an incandescent bulb mounted next to each other on an extension arm that you could adjust and fasten into place by tightening a couple of lug nuts. Mine ended in a little rod which you could insert into a table clamp to use on your desk or you could drop it into the top of a floor stand for a stand-alone lamp. It worked pretty well. The lens was pretty good and the light was fine, although it was hot working close to the light bulb. If used as a floor lamp, the lamp's upright pole leaned in the direction in which the magnifier was away from an upright position, but the base was heavy enough that it remained firmly on the floor. This lamp could also be disassembled and packed in a large tote bag to go to a bead class with me. It is still in my garage, in a tote bag, awaiting its next outing. Now my everyday magnification solution is a Dazor rolling floor lamp. I love my Dazor! It is so much better than anything I had tried before. It has a 5 inch glass lens, which is surrounded by a round daylight florescent tube. The lens and light are on an extension arm that reaches out easily from beside the chunky upholstered chair where I do most of my beading. 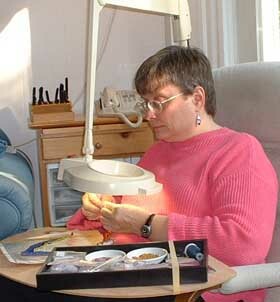 It is a great magnifier for beading for me and I am extremely happy with it. It came with a 3 diopter lens and I later got a 5 diopter lens which is what I am currently using. I have to give the tray of beads on my lap a boost to get the beads into the focal range of the lens, so I stack a couple of other jewelry trays underneath. I love my Dazor magnifier. I was lucky enough to get mine as a gift. If you want one, be prepared to spend about $300, or start hinting now for your next birthday! I guess I've had mine for over 8 years now. The picture of me and my lamp was taken in 2002. The only maintenance required has been one change of the fluorescent ring bulb and regular cleaning of the lens. The base is very heavy, so, unlike some lighted magnifiers, the lamp does not get tippy (tipsy?) when the lens in extended out from it. The lens quality is excellent. The lamp runs pretty cool; it would be impossible to burn myself, As I have done with incandescent magnifier lamps. It provides plenty of light for my work and the daylight fluorescent shows colors well. I am so used to beading under this magnifier that I sometimes forget how small the beads really are. If I have been doing a lot of work under the Dazor lamp, I need to be very careful putting beads away in my storage bins as (away from the magnifier) they look so small that I sometimes put the size 11s where the 15s belong, and the 8s with the 6s! Now, I have already admitted that I am a light and magnification junkie. If you are considering a Dazor, I suggest starting with the 3 diopter lens, which will give you a bigger working area that is in focus than the 5 diopter will. You'll probably be happy with that level of magnification, but if you are not, you can order the 5 diopter lens later. And changing the lens is really easy, so you don't need to worry about doing it yourself. Just remember to cover the lens before the sun creeps in the window, or you could find your couch starting to smoke!